We start model exploration with harvesting and documenting the current state. If you don’t have a current state and going green field, don’t worry we will get to that part. The primary goals are to collect reference scenarios, capture bits of the model and then leave most ideas behind. The starting point for this stage can be several of the following; A constraint formed out of a big picture EventStorming; A new project; or just a user story on the backlog. As long as there is a storyline to tell, it will be a good starting point.One of my favourite tools to use is EventStorming, a flexible tool when doing collaborate discovery of complex business domain. In just a few hours you can harvest and document a lot of knowledge. It is essential however for the success of this stage to know who the right people are to invite. These are the people who know the domain, the domain experts. We want to be inclusive as possible, but there are exceptions. It is vital that we create a safe place in where knowledge can flow freely, a great facilitator can do miracles, but there are limits. People who are toxic are killing for a productive workshop, so we might want to decide to leave such a person out. But this person can have a lot of domain knowledge essential for this stage. It is perhaps wise at this stage to talk to this person before such a workshop and see if we can get some information out, or even better but harder, change this person’s toxic behaviour so that this person can join the workshop. Now that we think the story is complete we want to bring in Example Mapping. Most of the time people will now believe that bringing in another tool is waste. We got our story visualised right; we got the full story? The problem is that everyone is subject to cognitive bias, especially when we get information overload. We notice things already primed in memory or repeated often; this is called the context effect and attentional bias. We are also drawn to details that confirm our own existing beliefs; this is called the observer effect and the confirmation bias. Especially the bias blind spot, noticing flaws in others is more easily than yourself is dangerous during our exploration of the domain. To battle these biasses we need to use different viewpoints, other tools. Example mapping helps us here because it focusses more on specific examples. Make room on a different part of the model space, either next to your EventStorm or on a separate paper roll. 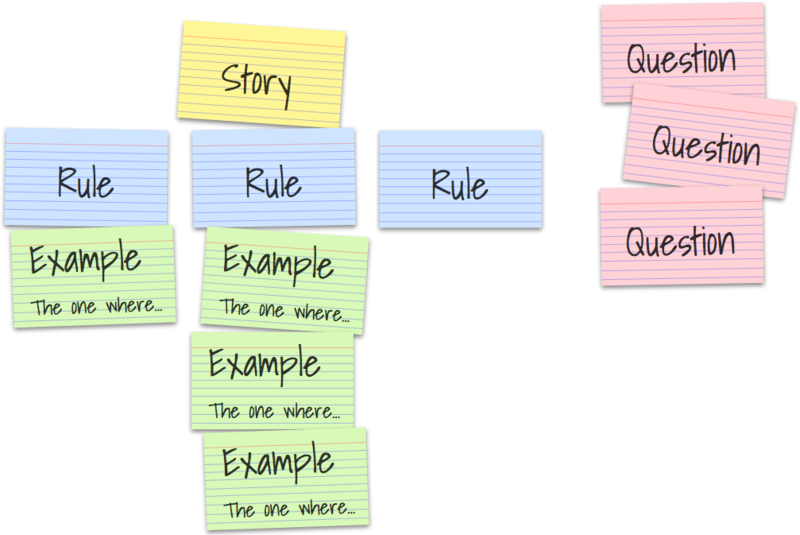 Start with the storming with writing down examples on (usually green) stickies in the form of friends episodes. Friends episodes always begin with the one where. Think out of the box, and see where these examples affect the current EventStorm. Is it a gap in the current system, or is it a gap in knowledge which is futile to go on, mark it with hotspots, make it explicit! Now at this point, with the people in the room, we probably harvest enough insight of the current state. Now we can already start seeing bounded context emerge, or see where systems began to entangle with each other, and the boundaries are not made explicit. This first part of the workshop will take about two to three hours, a minor investment to the knowledge that is gain. When we did so much knowledge crunching of the as-is situation, it might be wise to stop the workshop here and sleep over and process the acquired knowledge. © cucumber.io The business rules will match the business rules on your EventStorm. You will most likely also find new business rules you need to make explicit. When this happens, you might need to adjust your EventStorm with our newly acquired information. The goal of both tools is to share knowledge and explore complex business domains, so be careful not to go all out on making the two consistent. With our newly required knowledge, it is now time to start modelling. We first will explore different models and see how the models will hold up against the EventStorm and the examples on your example mapping. Try and find at least three models and quickly iterate over them. Once you end up with a workable model, we can now slice our example map. Discuss which business rules are the most important and start and formalise the examples. 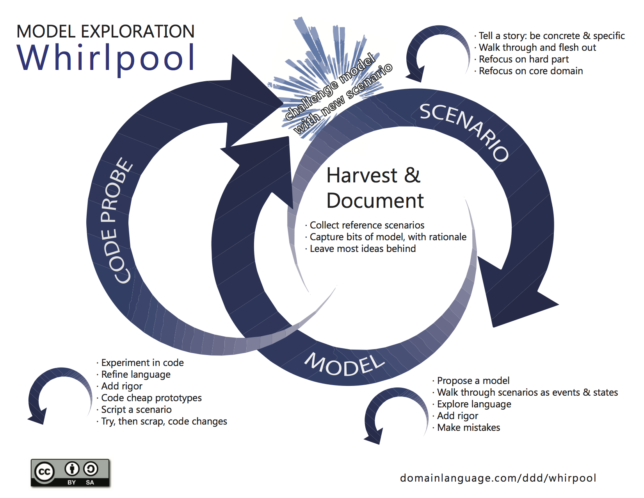 With our workable model and formalised examples, we can now start coding. Because we know what the system needs to do based on our formalised examples it is easy to use Test-Driven development to cheapy write a prototype of our model in code. This way we continuously refine our language and challenge our model.